Found in the city centre, this business space is in an attractive location with plenty of local amenities around you including beautiful green spaces. The centre offers a range of working spaces including private offices, meeting rooms and coworking spaces. The offices are bright and spacious, with plenty of natural light to boost your productivity. Your membership will include high speed internet and great telephone connectivity. The centre is served by plenty of public transport links including bus stops and eateries. 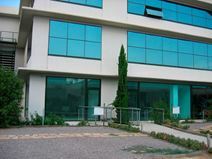 Located in the main industrial park in Murcia this centre was opened in 2004 offering a range of serviced offices. Offices are of different sizes and can be fully furnished and ready to use or unfurnished but including internet, telephone, ADSL and air conditioning. Clients are also able to make use of the excellent services including: reception service, secretaries, consulting, underground parking, a café/restaurant and a day care centre.